Now that the teething is over, and The two bottom front teeth have popped through, we’re back to weaning again. It was a difficult few weeks, apart from a bit of porridge in the morning, Emily wouldn’t have anything else apart from formula. Now that we’re back to weaning, I’m trying everything to get Emily eating a wide range of foods, tastes, textures, along with finger foods to just get her tastebuds going and open a new word of food to her. She’s getting there, slowly, but it’s fun seeing her squirm, or her face light up with interest as she gulps down the next mouthful. I’ve tried a few different methods to get her eating. Since she was 3 & 1/2 months she’s eaten porridge almost every day. 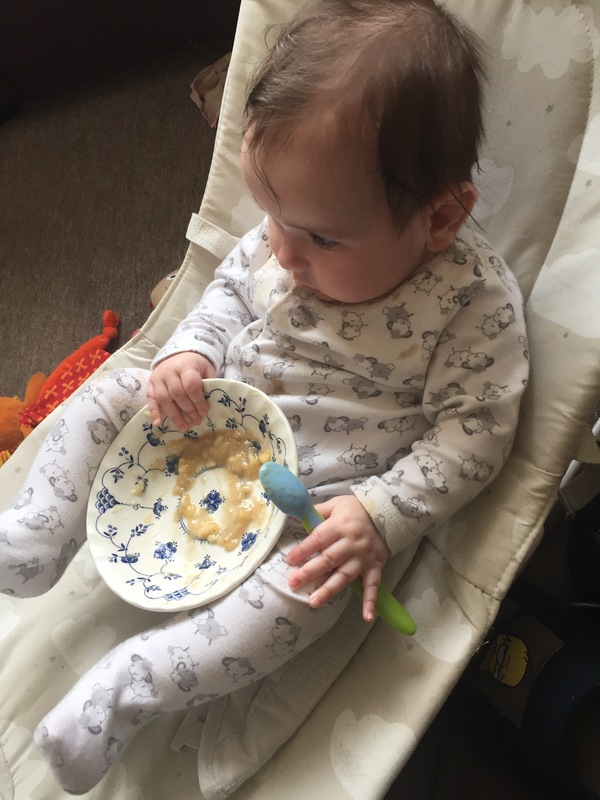 She loves her porridge, messy, but she loves every spoonful of the oaty goodness. It’s difficult though finding ways to feed her foodie adventure. 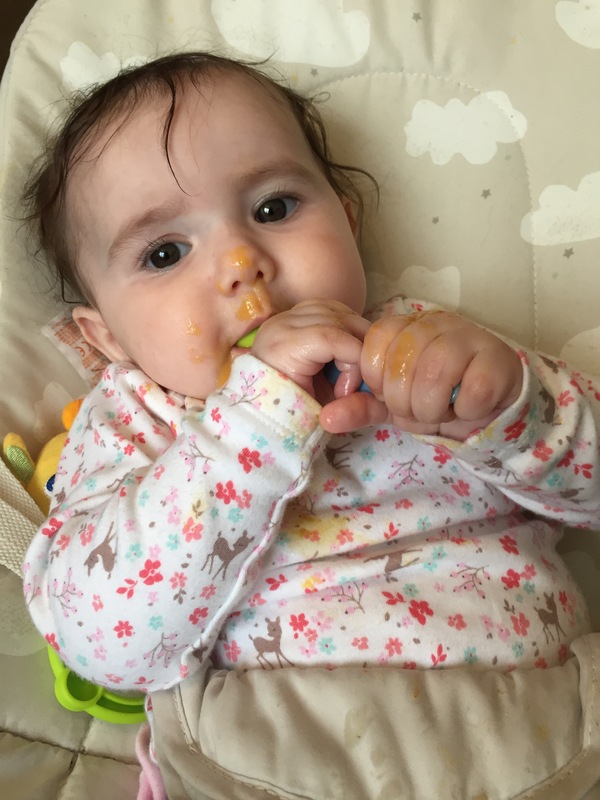 When I was pregnant I was adamant that when it came to weaning I would do everything myself but since I’ve been weaning Emily, that hasn’t been much of an option and I’ll tell you why. Mainly waste. I can’t just make a tiny amount of food as this won’t fill the food processor to purée or mash and whatever that has been leftover I’ve frozen but Emily has since refused to eat it after I’ve heated it up. 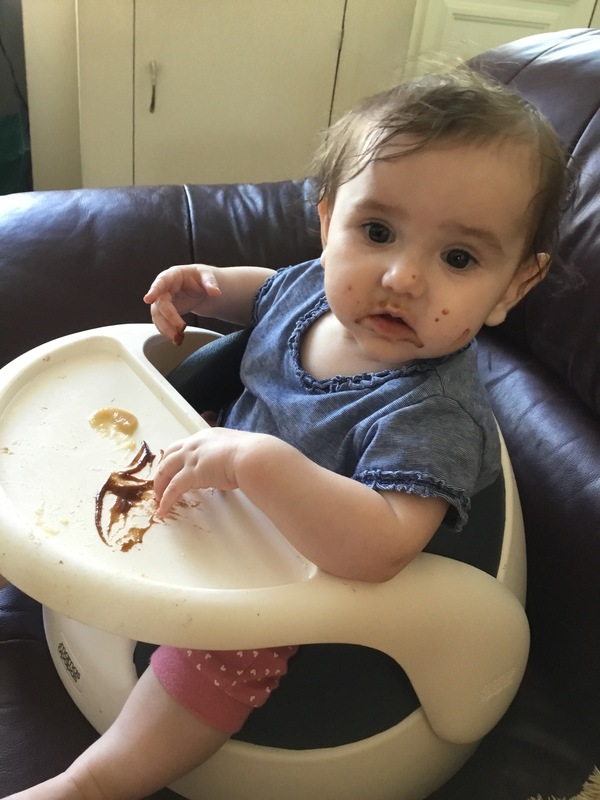 According to the Guardian “UK households binned £13bn worth of food in 2015 that could have been eaten.” OK, so Emily wouldn’t even be a smidge or a dent on that, but I hate waste and there’s been a little too much of that since I’ve started ear weaning process. A potato here or a leek and onion there is still waste. Gosh, I’m such a fuss pot! So i tried a little experiment. I wanted to see what worked best for Emily. Which way was more beneficial for her, whatever the cost. I tried 3 ways, jar, pouch and DIY. When I was a baby my mum fed me jar food, it was the norm back then, but that was 31 years ago. Fast forward to now and there is so much on offer for babies. You can get anything for every palate, it’s really quite amazing. This is an odd one. Emily isn’t so sure on the jar food. I tried because I thought that she might like the flavours but honestly, have you tried any of them yourself? They’re revolting! They’re excellent value for money but Emily clearly has a taste for something beyond jars, so after trying a few times, the rest of the jars I have, I’ll give them to a food bank or something. Using pouches are great, a little expensive if you don’t use them as often (or use them a lot, depending on the brand) but they’re great to start getting your baby interested in different foods. Currently Emily is loving prunes, pears, carrots do sweet potato but hating parsnips, apples and peas. Funny because she loves the broccoli, pea and pear pouch – yes it smells as gross as it sounds. Currently Emily is eating pouches from Ella’s kitchen and Aldi’s. Elers kitchen can be very expensive unless of course there are deals on, which for some reason in recent weeks is not the case. If I’m near Aldi then I will buy whatever pouches they have on offer, recently they only seem to have the fruit pouches. Making food yourself for your baby is a commitment, whatever your culinary expertise is like. I love cooking. I’ve been doing it for as long as I can remember and it makes me smile if someone enjoys the food I cook or the cakes I bake. With Emily I’ve tried weaning her with the vegetables I bought and most of it ended up in the bin. I tried using baby stock cubes (yes they do exist) and various little things to open up her interest in certain vegetables and whilst she’s loved some, most of the time they’ve been wasted. What she may love one day, she refuses to have the next. Whatever planet health visitors live on who say do ice cubes worth of food haven’t actually fed a real baby. Emily can want anything from 2 mouthfuls to 10, maybe more, depending entirely on her appetite that day. I don’t think there is a right way or wrong way feeding your baby. As long as they are getting the nutritional benefits and are feeding well, which ever way you choose to feed your baby, is the right way. I plan to feed Emily similar foods to what Sam and I have been eating, obviously without the salt, or spices, or sugar, it will be interesting to see what she thinks of these foods. I suppose that will be the next blog post!